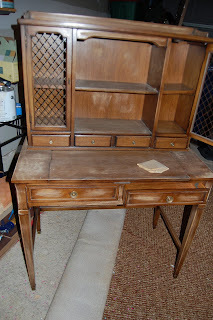 Bits of Splendor: A 1950's Vintage Desk Makeover! I'm calling this room a "creative room" because that's what it is. A place for us to be creative. I've cleared out all of the toys...given away as many as the kids would let me, and the rest have been organized and tucked away into their closets. I only kept things like puzzles, blocks, coloring books, play doh, board games and books in the room. I'll show you the whole thing soon but I'm a perfectionist... there are still just a couple small things left to do and I don't want to show it until it's all done. ....and then I DID them. What I learned through this process is you do not always have to go off what someone else did or how they did it...try it yourself, come up with your own way. If you like it...do it. If you'd like to do it...try it. If you see something you like, don't be afraid to copy it in your own way. Be creative and don't be afraid to try something. If you make a mistake or it's a total fail, oh well! Try again! One of the biggest projects in this room was the furniture. I did not want even a freckle of "dark." My whole down stairs is "dark"....wood floors, espresso furniture, chocolate brown sofa....So I wanted the upstairs WHITE, BRIGHT and COLORFUL. So that meant painting. 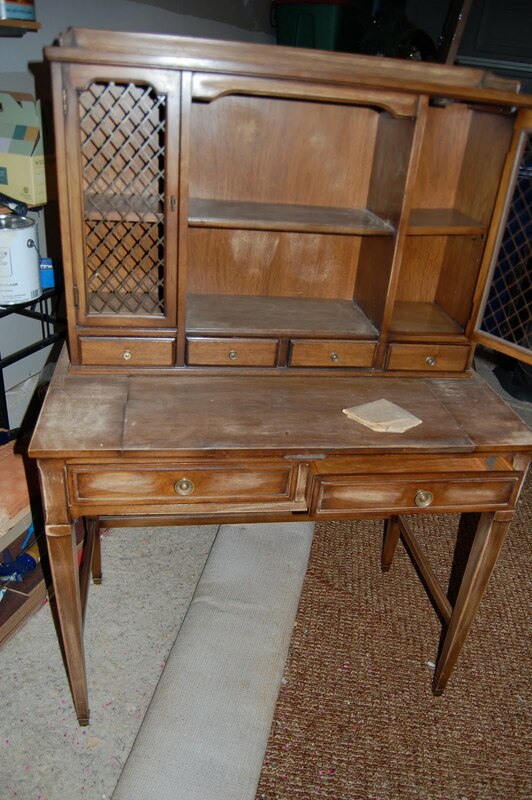 I bought this desk from a cute young couple who had just had a baby. It was her grandma's desk, made in the 1950's. They were sad to see it go but just didn't have the room with the new baby. Score for me! First things first....I took off all of the hardware and the cabinet doors. Then Brandon sanded it. When he was done, I wiped it down real good and primed it with "kilz" primer. I gave it about 2 coats and let it dry over night. Then I sprayed it with Krylon's "Celery." Yes I used spray paint. Yes I was nervous about that, being that I'd never used spray paint on furniture. BUT after doing some reading like here, here, and here.... I felt assured it was the way to go for what I wanted to get it. Plus my hand was cramping bad just from the priming. A note on spray paint, because I didn't know this....In the beginning, I was buying it at Hobby Lobby where it's about 4 something a bottle...almost 5 bucks. Pricey if you need a lot. Then I found out that WALMART carries it. And there is an array of options there! More than Hobby Lobby. And it's only 3.24!! So, get it there! The downfall is, you have to wait for a worker to come open the cabinet for you and they aren't always too snappy about it...especially when you're having to bounce up and down with your 4 month old in the sling, while having to tell your 3 yr old to sit her booty back down in the cart and yelling your 5 year olds name across the store to come back....but nobody will notice that part because it's Walmart. Not to worry. The last step was to seal it with a coat of polycrylic to protect it. I wanted a muted vintagey color that would go well with this print that I ADORE. and was the inspiration for the look of the desk. I love everything about it and I am in search of a typewriter like the one in the picture. Seriously, I told Brandon it's what I want for Christmas, my Birthday, Mothers Day...whatever, I just want a vintage typewriter. Bad. Make it happen Babe. and little green vintagy ones on the drawers. All of the glass containers were purchased at IKEA. They hold glue sticks, smaller fabric scraps, buttons, push pins, headbands, scissors, paint brushes etc. I love this little glass container. I found it at the thrift store for 1 dollar (hollah! )...I put a little piece of scrap book paper in it and spelled out "INSPIRE" with some black sticker letters I had. When I need a little inspiration or encouragement, I can grab one out and read it. I'll add to it as I find more inspirational words to put in there. I am a believer in the power of words and that readng them can change your day, moment...perspective. I need that sometimes....don't we all? Again with the old typewriter. I was flipping through the Anthropologie catalog and saw it. Loved it. Then had an idea, why not turn it into ART. So I grabbed a white frame I'd bought at Target for like 1.50 on clearance, cut the page to fit my frame and there you go....art work ala Anthro....for a dollar fitty, ya'll. Anthropologie journal is from my sister and brother in law- Heather and Brent. It's special to me. They gave it to me for my birthday 2 years ago. They've been some of my biggest supporters and encouragers of my writing. It's one of my favorite things. Since Bella could stand in her crib, she would pull herself up and look out a little window she had above her crib. I would listen to her through the monitor while she "talked" to the birds and the people passing by. She would do this for about 30 minutes every morning. When she got older and could talk she'd tell me all about what she saw. Now, she does the same thing at this window. It faces the front of the house, which is perfect for a nosey neighbor like herself. 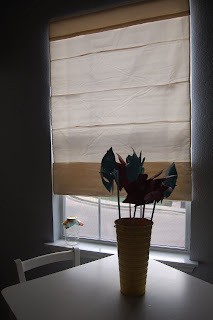 Originally there were dark wood blinds that I would pull up for her almost every morning, but the cords would always hang and I didn't like that, plus I didn't want the dark wood anymore, so I searched for some roman shades that would be easy to pull up and not have a cord hanging down. I found these and they are PERFECT. Not only because they were exactly what I was looking for, but there is no cords and the kids can't reach the handle to mess with it. I open it in the morning and it stays that way all day. The fabric is really nice, thick and durable feeling too. I didn't clean it up before taking the pictures the other day cause that's what it always looks like anyway! Some days I let them eat their lunch up there. They love it. The "centerpiece" is a tall yellow tin from the dollar spot and windmills I also found at Target that I spray painted to match the room colors, I'm going to add a couple of red ones too. 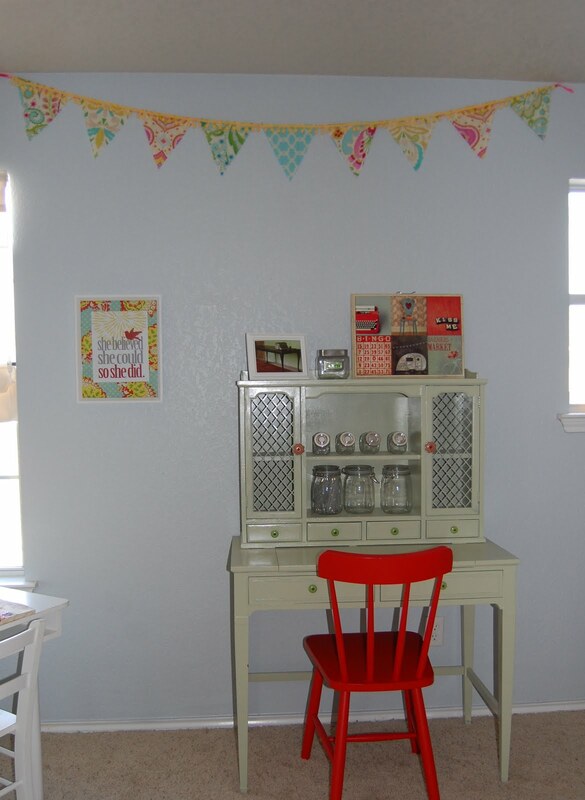 There is so much to this room I want to show you like the "no-sew" pennant I came up with and that you see hanging... but this post is officially the longest post EVAH, so I'll spare you.... All in time! "As you take the normal opportunities of your daily life and create something of beauty and helpfulness, you improve not only the world around you but also the world within you"
No wonder why your triceps are lookin' so nice :)Great Job! Laura! You're desk turned out beautifly and I adore the color! So sorry you had to learn about expensive spray paint that way! I hope that I helped you and I am so glad that you took the plunge to SPRAY PAINT furniture! It is awesome! Love the desk, especially the cute knobs! Nice job! Amazing! 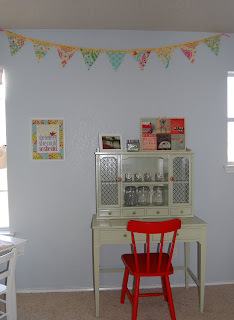 The knobs, the colors, the pennant, the print...you get the point! You rock! Have a great weekend! i love this --- you are so inspiring. we're moving back to california this fall and i fully intend to use some of your ideas in abby's new room - thank you for spending the time putting this post together & sharing with us!! The desk looks wonderful and what a labor of love. this is so inspiring. you did an incredible job. 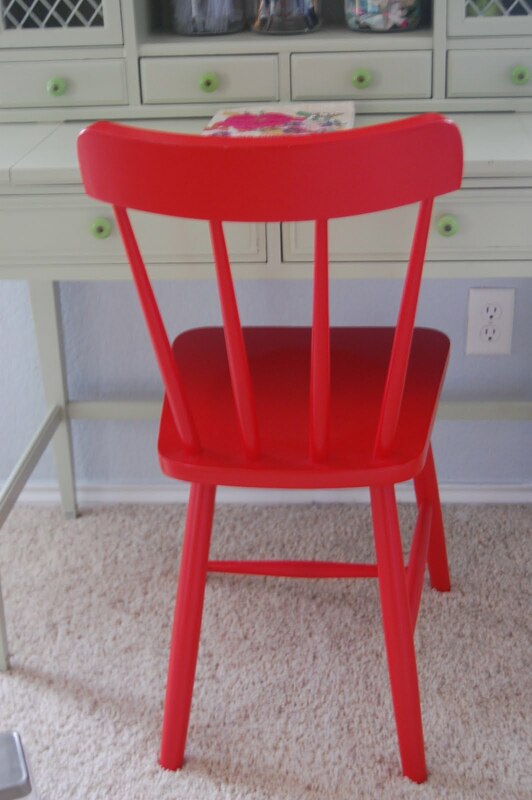 la la la love the red chair! i an the pin wheels. great job on that desk. it has a new life! You LUCKY girl! That desk is so cute! I'm so jealous. And you did awesome on that redo. I love the after. 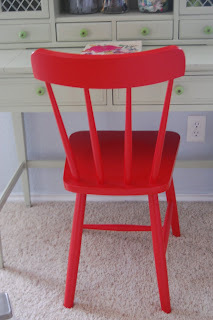 THanks so much for linking up to thrifty thursdays! You are going to be featured today! I can't get over how cute this is still! Hope you don't mind, I posted a link back to this on my fb page! Happy Thursday!